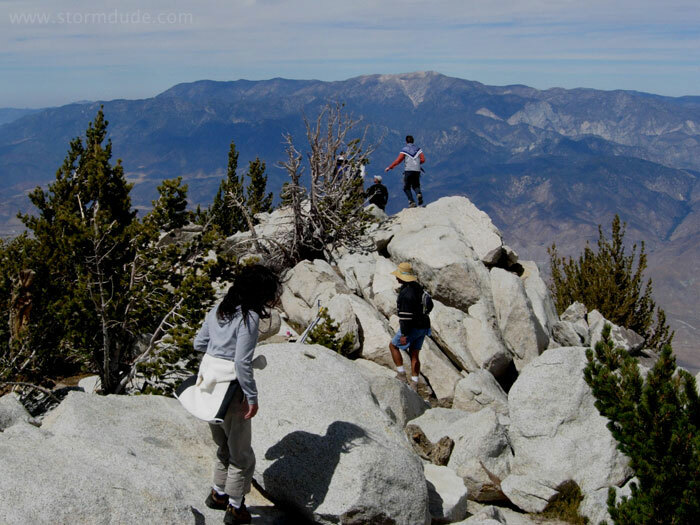 Mid-morning in late September as we hike from the 8,500-foot tram station above Palm Springs to the top of San Jacinto Peak. 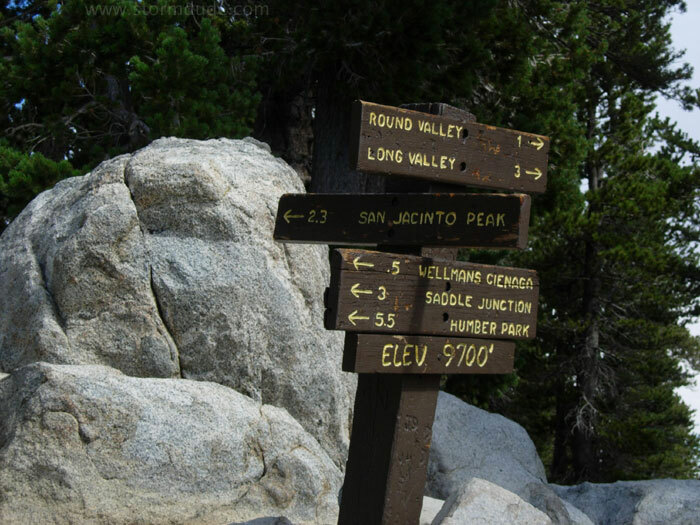 Today we will cover 12 miles, with a total gain of 2,400 feet. Lots of water due to heavy snowfalls of the 2004-05 winter. 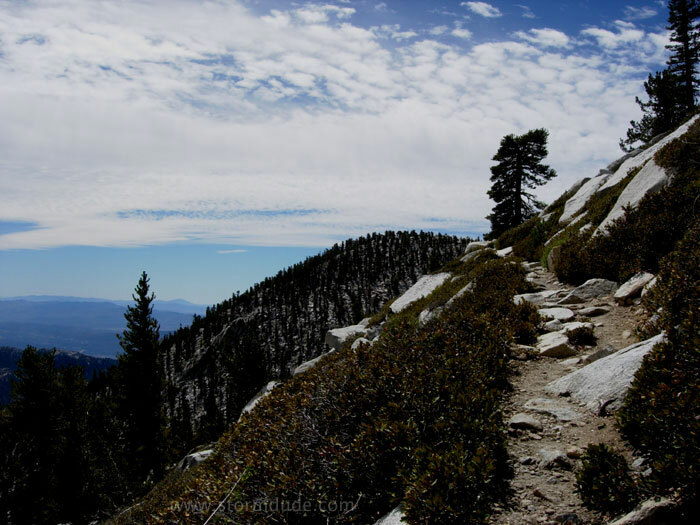 Gusty winds and temperatures in the low 50s make this hike rather cool for September, but far better than the heat of summer in the Southern California mountains. 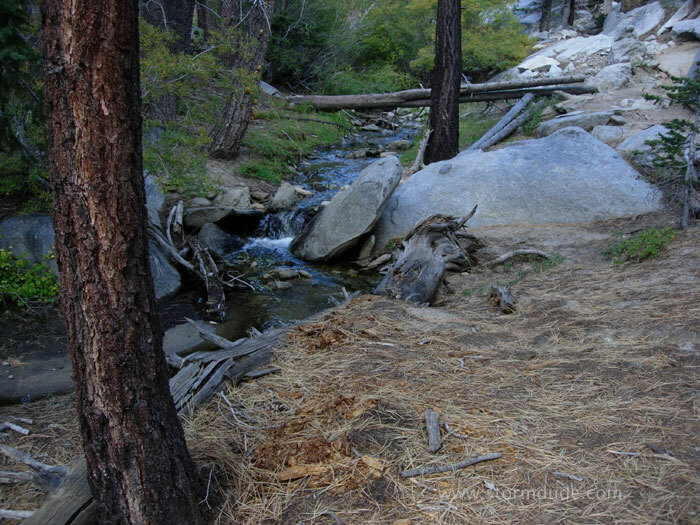 With flowing streams, abundant granite, rugged trails and cool weather, this hike seemed more like the Sierras than Southern California. 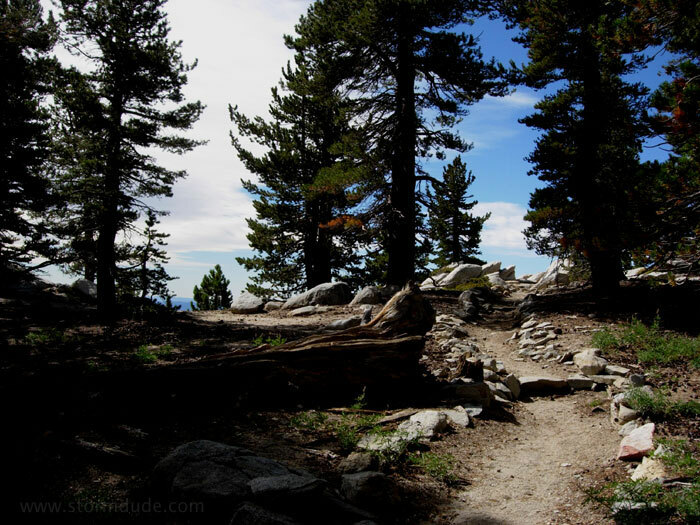 Reaching Wellman Divide, a crossroads for backpackers and hikers coming up from Idyllwild, which is on the western side of the wilderness area. Views looking south across the San Bernardino National Forest towards the Santa Rosa Mountains. 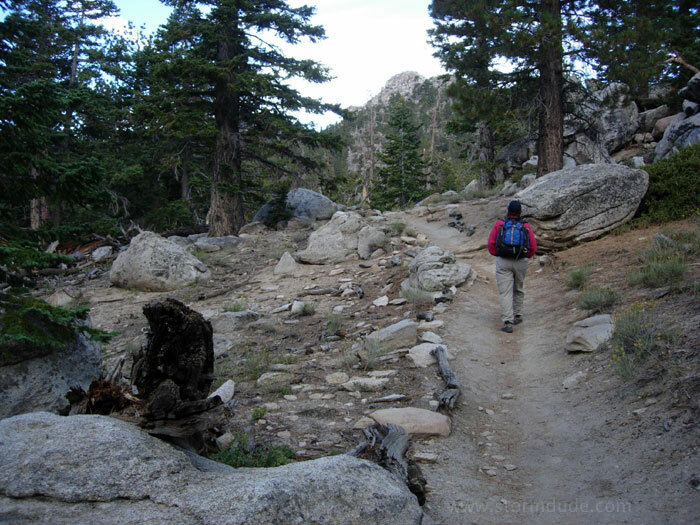 Many people hike or backpack across the San Jacinto Wilderness between the Tram and Idyllwild. 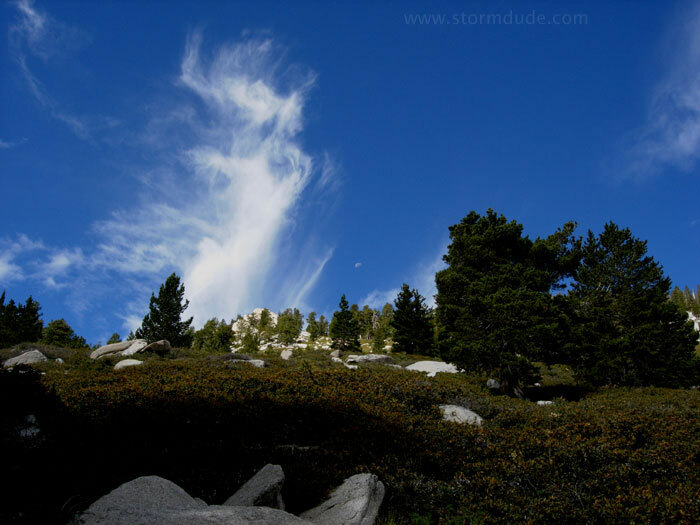 As we reach 10,000 feet, strong winds blow cirrus clouds above the ridge. 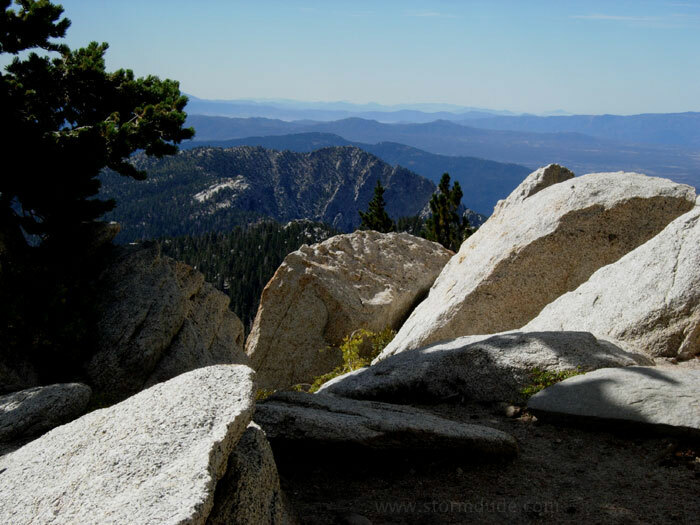 Granite outcroppings as we climb the ridge. 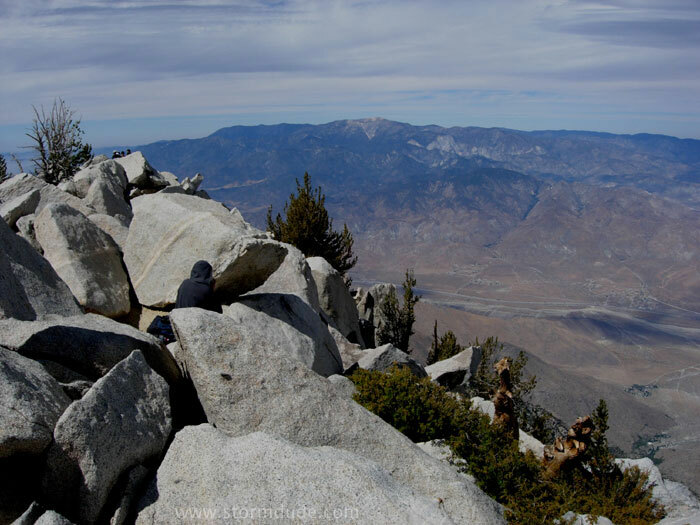 Long-distance views as we traverse southward below San Jacinto Peak. We are now at 10,500 feet and beginning to feel the effects of thin air (after all, we were at sea level only six hours earlier). 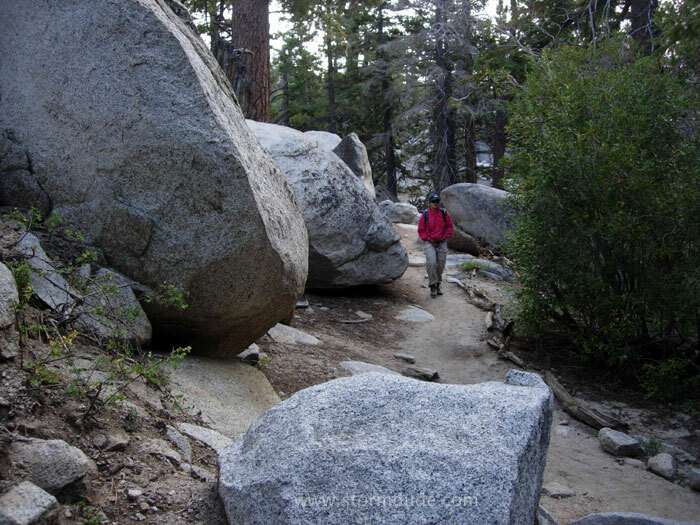 Winding through the rocks on one of the roughest trails we've hiked, again more like the High Sierras than Southern California. 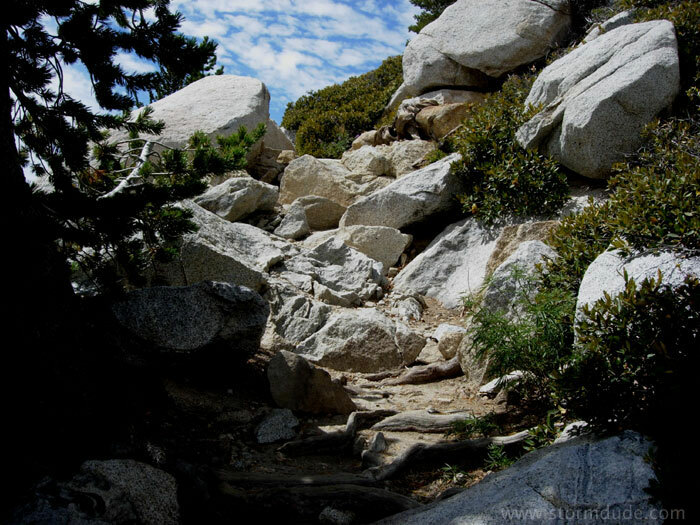 The final portion of the trail is a steep scramble up a boulder field to the peak. 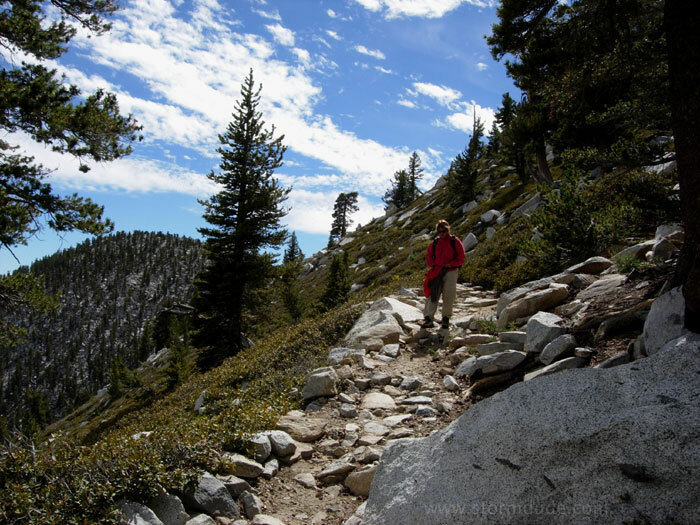 The best route is nearly due east of the peak, where you need to use your hands for balance and not for climbing. 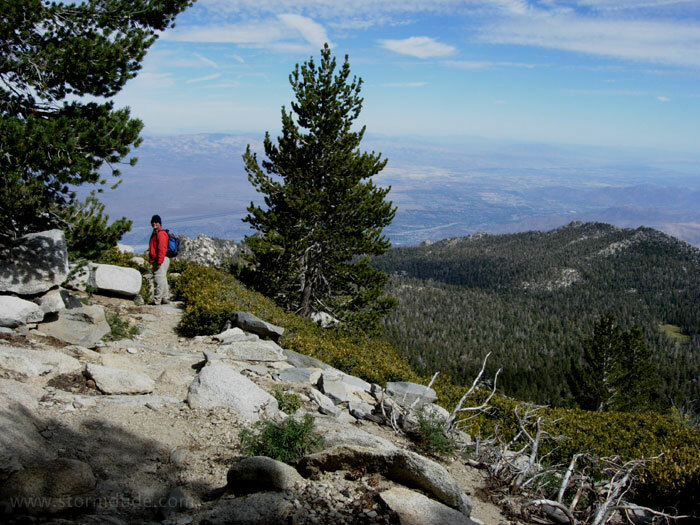 Ah, the remoteness of a Southern California peak! On top of a mountain after one of the more challenging climbs we've done. 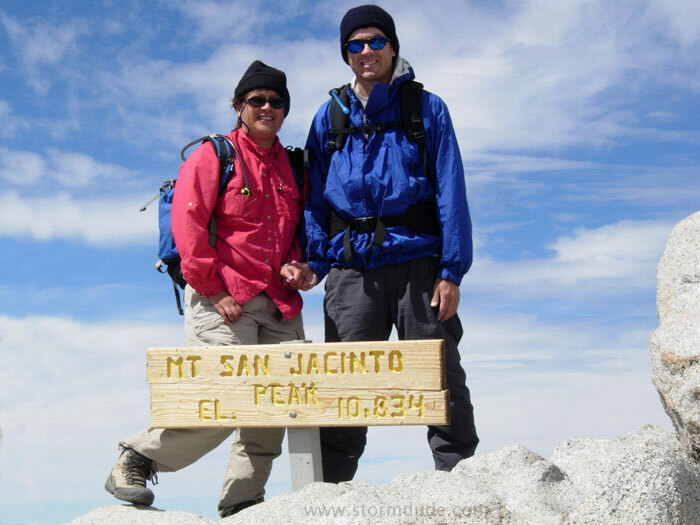 San Jacinto is one of the three landmark peaks of the L.A. area (Mt. 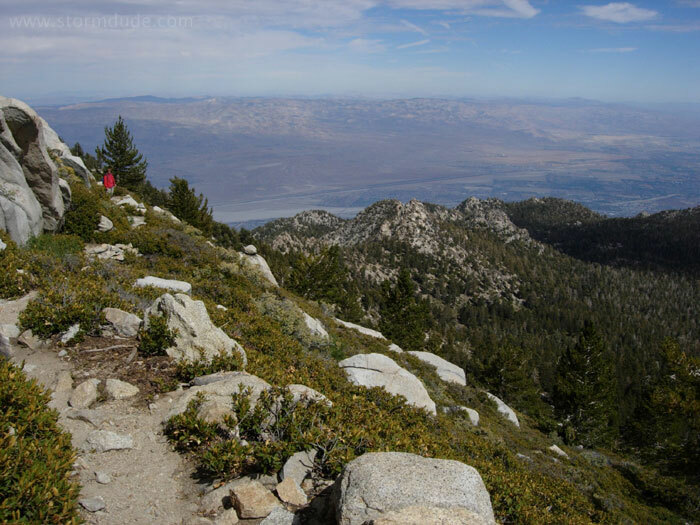 Baldy and San Gorgonio are the other two). Looking south from the windy peak. Looking north as other hikers work their way across the boulder field to the northern edge of the summit. 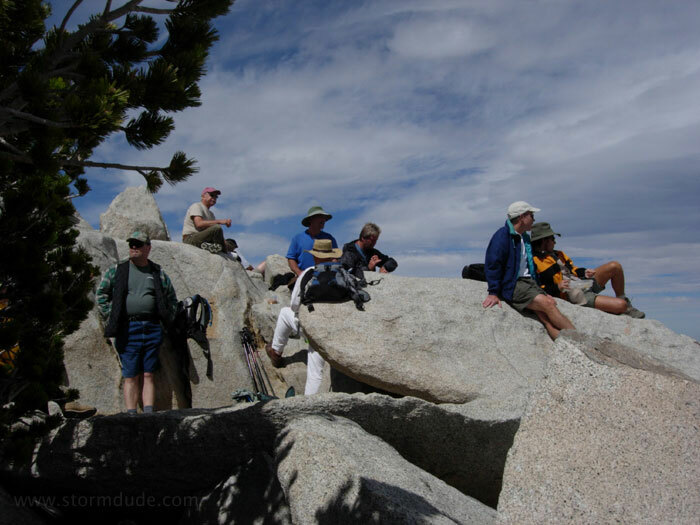 A ranger told us she has seen as many as 50 people on the summit on summer days. 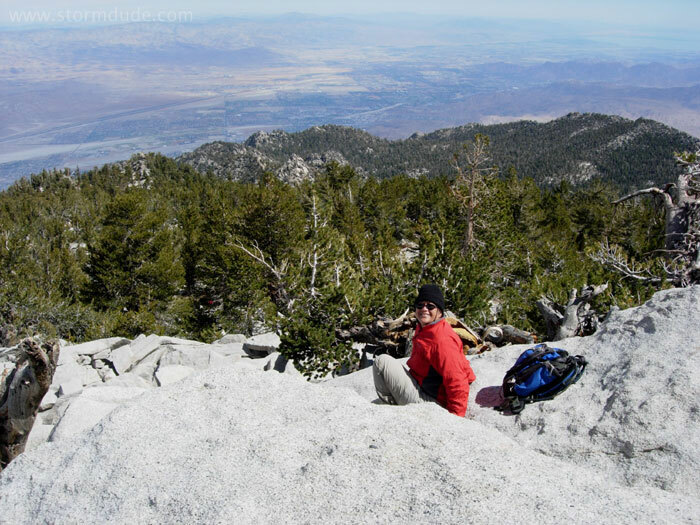 We find a lunch spot a few feet below the summit on the east side, out of the cool, gusty winds. 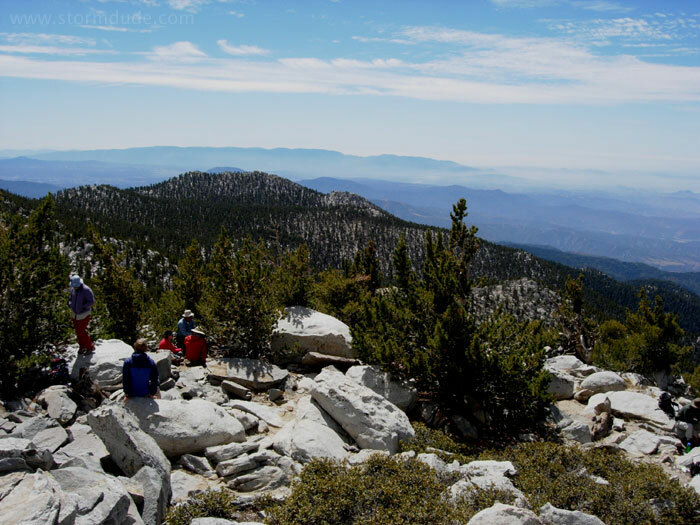 View of San Gorgonio (elevation 11,500) as we eat lunch in the warm sun. We leave at 2 pm for our return trip to the tram. Great views of the desert resort cities of Coachella Valley during the initial part of our descent. 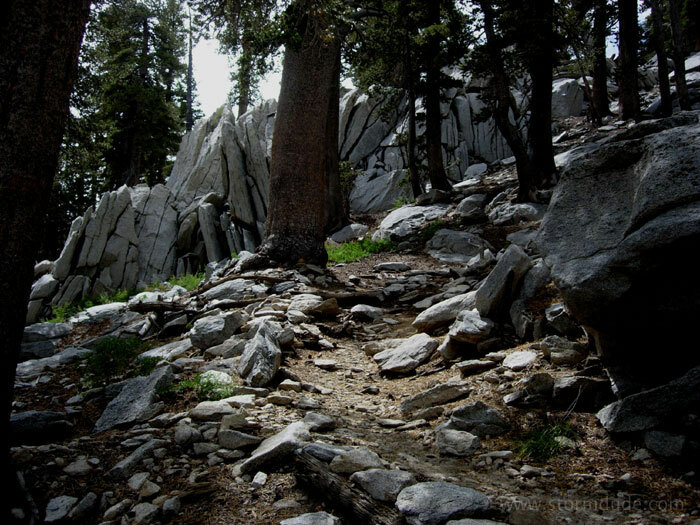 Mid-afternoon in the San Jacinto Wilderness. 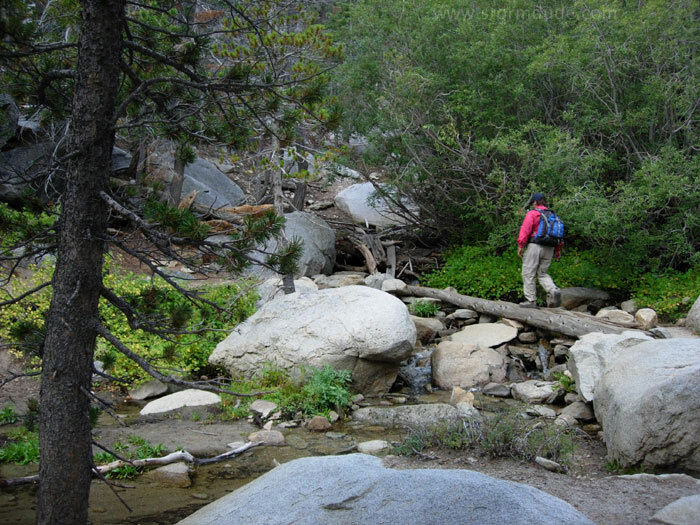 Another hiker described this as a "mountain oasis." 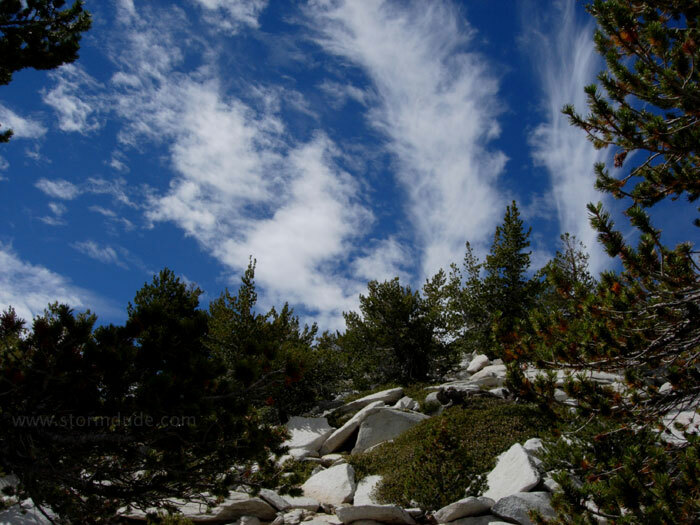 Definitely among the best scenery south of the Sierras.